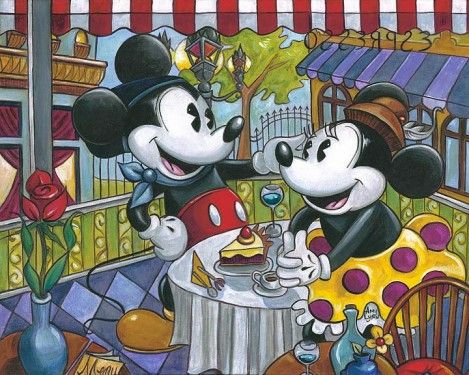 Amy Lynn Hand Embellished Limited Edition Textured Canvas:"Cafe Mickey"
Edition / Medium: Artist Hand Signed and Numbered Limited edition to 95 with COA. / Hand Textured Canvas Giclee. About the Artist: "The People and places I create are the substance of romance and intrigue; where a flirtation from a stranger is more than just the batting of an eye...it's an invitation into an enchanting world." On any given Saturday night, you can find artist, Amy Lynn at her artist loft in Downtown Los Angeles. Surrounded by fellow artists, live music and lots of art. Amy Lynn is living the life she has always dreamed of. Over the past few years Amy Lynn has become a highly collected artist. Her signature style and Art Deco motif have earned her a place in today's competitive art market. At work in her studio, sunshine pierces through the skylight and a fresh canvas awaits a new story. She muses over what will come...a story of unrequited love, a martini filled celebration, hipsters lounging in exotic locales. Amy Lynn picks up a brush and begins with the flirtatious eye of a stranger. After earning a BFA in painting from the University of Nebraska, Amy Lynn moved to Minneapolis where she lived and worked as an artist for almost ten years. As her life broadened, the world in her paintings grew bigger and bolder. Needing to experience more, she packed her bags and moved to the West Coast. In 2004 Amy Lynn moved to Los Angeles. With one exhibit after another, art critics hailed Amy Lynn as "one to watch". In 2005 Amy Lynn was commissioned to do a series of paintings for the New Otani Hotel in Downtown Los Angeles. Those paintings now decorate the bar and lobby of this popular hotel. Amy Lynn's artwork was also featured on the FOX hit show, "Hell's Kitchen", and recently she was asked to create paintings for an upcoming feature film. In 2007, "Art Business News" chose Amy Lynn as an "Emerging Artist". She was also featured in "Décor" magazine, and her work has graced the covers of many local magazines.